Prepare to fall in love with this casserole! A few simple ingredients combined to create a casserole that will please the entire family! 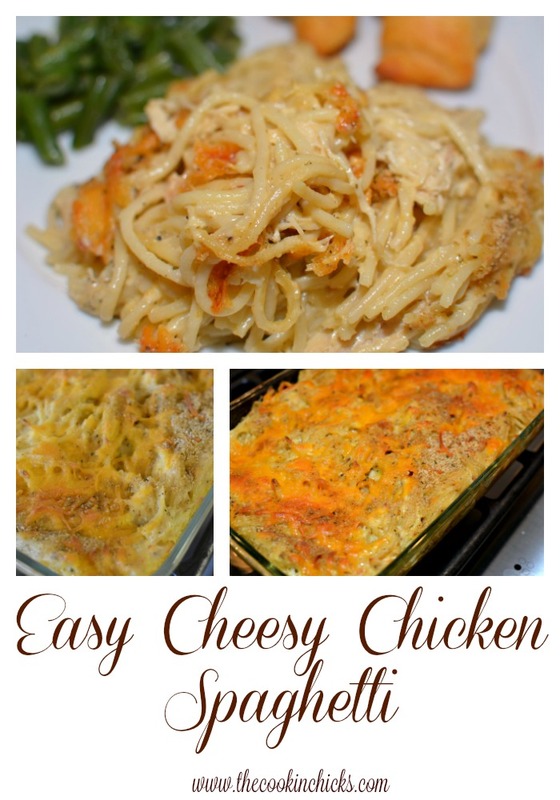 Nothing screams comfort food more than cheesy pasta dishes, right?! Well, look no further because this casserole is all that and more! 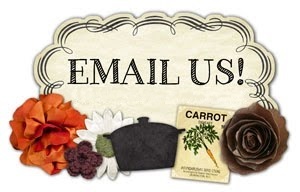 I made several of these casseroles a few weeks back for friends/families and everyone thoroughly enjoyed them! My family of five was able to enjoy it for dinner two nights, as well as lunch leftovers. I even heard from a few of the families that they froze theirs and it reheated perfectly a few days later! 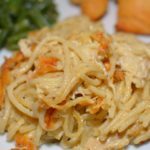 This dish is similar to a chicken tetrazzini, however, since using spaghetti noodles and chicken, I opted to call this chicken spaghetti, haha! This recipe serves about 10-12 people, so its perfect for large crowds, potlucks, freezing, and more! Best part, most of the ingredients are ones you probably already have on hand! Hope you enjoy as much as my family does! 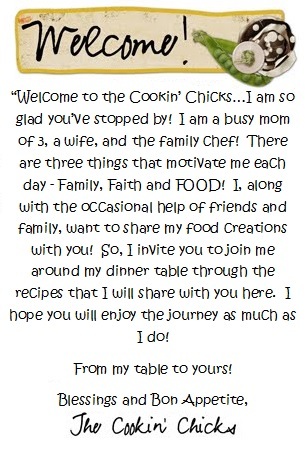 Be sure to use the hashtag #thecookinchicks and share on Instagram so I can check out your creations! 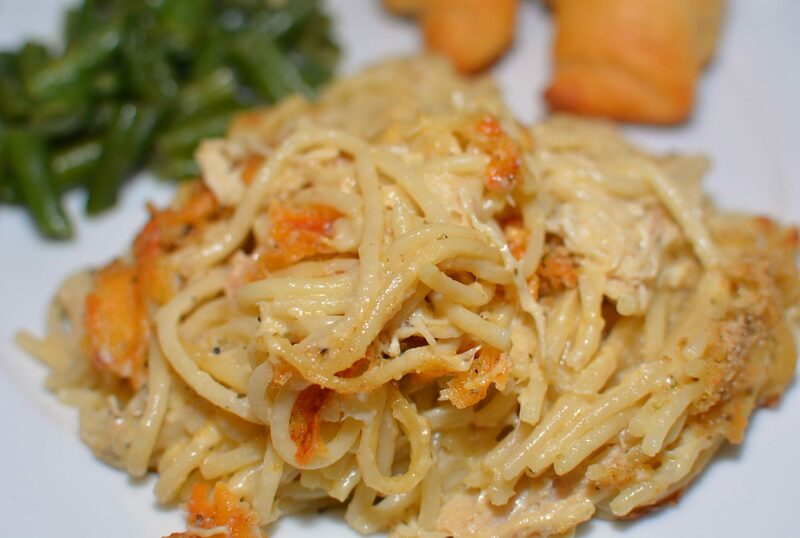 In a medium bowl, combine the cooked chicken, spaghetti, cream of chicken, chicken broth, sour cream, butter, cayenne pepper, Italian seasoning, salt, and pepper. Sprinkle Parmesan cheese and cheddar cheese evenly on top followed by the breadcrumbs. Place pan in oven and bake for about 45-50 minutes. Remove pan from oven and enjoy! Awww thanks!! I like to keep things yummy and simple, so you are in the right place, hehe!! This was so delicious. Since there’s only 2 of us, I made half the recipe. I would have had a third helping, but didn’t want to seem like a pig, so will have left overs today. Yea! So glad you enjoyed it! It freezes well too for next time if you have leftovers!